Founded way back in 1615, Cabo Frio represents the seventh-oldest city in Brazil. Visit Prainhas do Pontal do Atalaia and Forno Beach for some beach relaxation. Deepen your sense of the past at sights like Nossa Senhora dos Remedios Church and Igreja de Sant'Ana. 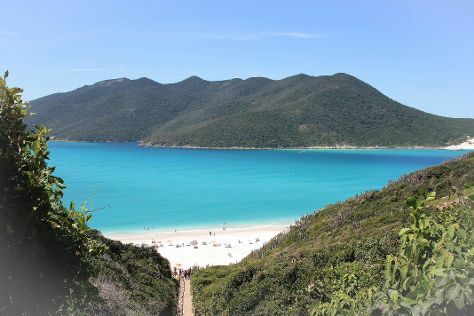 Venture out of the city with trips to Armacao dos Buzios (Joao Fernandes Beach, Geriba Beach, & more), Capela Sao Joao Batista (in Barra de Sao Joao) and Arraial do Cabo (Farol Beach & Praia Grande). There's more to do: enjoy the sand and surf at Praia do Forte and stroll through Dunas Beach. To see traveler tips, more things to do, maps, and other tourist information, refer to the Cabo Frio trip itinerary app . March in Cabo Frio sees daily highs of 35°C and lows of 26°C at night. Finish your sightseeing early on the 23rd (Sat) to allow enough time to travel back home.